The iPhone X has been refined to the point of perfection in the eyes of Apple, but it took a lot of failures to get there, according to its lead designer. 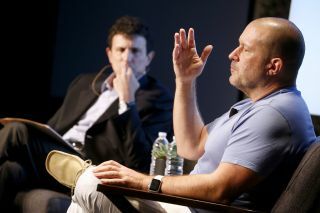 Apple Chief Design Officer Jony Ive, in a rare media appearance, revealed that the new iPhone was in development for half a decade – all the way back in 2012. "That technology is something we've been working on for five years, and we had prototypes that were this big" said Ive about the TrueDepth camera's Face ID and Animoji features in the 10th anniversary iPhone. This means while you were toying around with the 'new' iPhone 5S and its novel fingerprint sensor, Apple was busy crafting the beginnings of the iPhone X, which ironically, lacks a fingerprint sensor. Ive described the grueling development process to get to a finished device. "For 99% of the time, it didn't work for us," he recalled. "For the vast majority of the development cycle, all we had were things that failed. By definition, it was if they didn't fail halfway through then we'd be done." But Ive also called the development process of making a new device "extraordinary," and said it's the part he enjoys more than the actual product. "What I will remember most fondly will be not the products, but it will be the process," he said when asked if he admires people all over the world using the iPhone when he's out in public. "I tend to be so completely pre-occupied with what we're working on at the moment." So, with so many failures to get to success, what has Ive felt were his most interesting failures? "I'm not sure if failure was interesting, really" he said. He did point out that there are design failures at Apple, but they're the right kind. "We've made numerous mistakes. But I'm confident that the mistakes weren't born from laziness or some self-satisfied belief that it’ll inevitably be successful." "I think we're bunch of very anxious, worrying individuals who generally assume it's not going to work unless we can prove otherwise," Ive concluded. Will the iPhone X be the 10th anniversary smash hit that Ive and his design team at Apple are hoping for? We'll know when it launches on Friday, November 3. In the meantime, check out our hands on iPhone X review.